The Paon Cooking Class was recommended by a friend, and we're so glad we booked. Wayan's driver collected us from Sanur (and hour's drive away) and took us to the padi near Laplaplan, where we were met by Wayan. Wayan is the most delightful host: he took time to show us (my husband and two teenage girls) the padis and explain how rice is planted & harvested, and how the community shares much of the work and water to keep the local economy spinning along. Next we drove to Wayan's house in Laplaplan village. Puspa was not able to be with us on this day, but Wayan and his amazing chef Nyoman took care of everything. As this was a dinner class, we didn't go to the markets, but instead had a very comprehensive tour of the padis, and then a thorough guide to and explanation of each of the shrines in the temple part of Wayan and Puspa's house. We were very interested in this and Wayan took plenty of time to explain the details. In the meantime, Nyoman had prepared the dinner ingredients, ready for us to commence cooking. 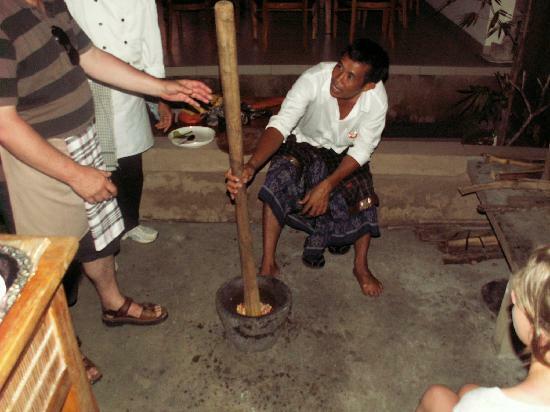 Nyoman took over at this point and delegated a chopping or slicing job to each of us. 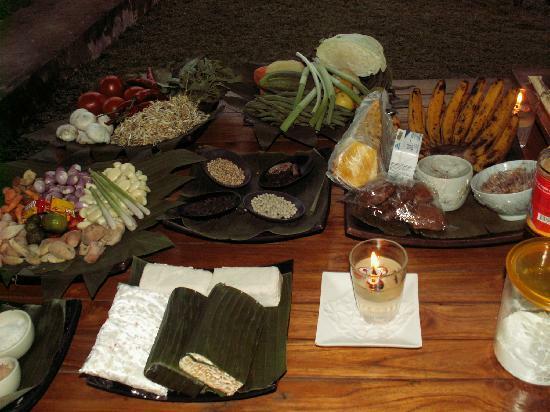 We all participated in preparing a great range of dishes, and "basic sauce" to make spicy mushroom soup, gado gado (FANTASTIC), tuna in banana leaves, chicken curry, vegetables, tempe, and jackfruit dessert. All this takes place in Wayan's beautiful outdoor kitchen and dining area overlooking a lush valley. Just magic. We had plenty of time to chat with Wayan during dinner, and felt completely at home. Wayan made us feel like very welcome dinner guests. Thanks for one of the most memorable holiday experiences our family has had!